A mock-up of what the former pool hall could look like. A first public exhibition showcasing plans for Haggerston Baths has sparked concerns from local residents over a lack of community space. Castleforge Partners Limited, whose bid to redevelop the iconic Whiston Road building was selected by the council in 2017, invited locals to give their feedback on its designs at an event at the Kingsland Hub last month. Kanda Consulting, acting on behalf of Castleforge, put up a number of boards, with the public asked to fill in the blanks with their thoughts on various aspects of the plans. Castleforge, which last year agreed a 250-year lease with the council, is expected to submit a planning application in June. 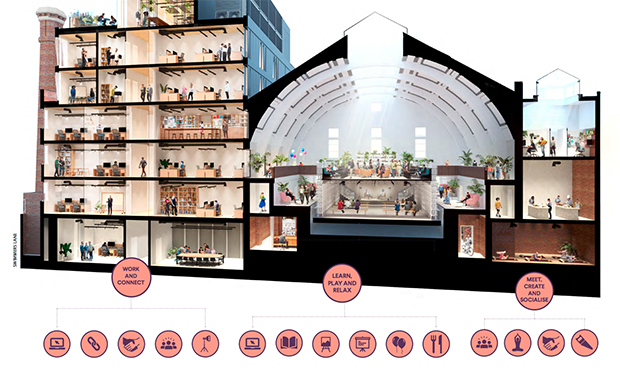 Its proposals include event space, studios, and workspace “available at an hourly rate to building users and the local community”. There will also be a multi-purpose area on the ground floor to provide “affordable space for a variety of needs, such as yoga, cookery classes, resident meetings” and a gym which will “be available to the community to use on weekends”. However, the plans have been with scepticism from locals. Gregory Martinez de Riquelme, an architect and university lecturer who lives close to the Baths, said: “I understand they have to create spaces they can gain revenue from, but they are creating so much rentable space on the sides of the hall, that the main pool hall should be designed to fit the community more. Kanda Consulting told the Citizen that the plans “will deliver affordable workspace in line with planning policy” and that the developers are “currently in discussions with Hackney Council about how this will be managed and operated in the development”. They added that “any member of the public will be able to walk into the Baths and appreciate their beautiful surroundings”. Joady Brennan, retired NHS employee who lives on Whiston Road, said she does not feel that Castleforge’s designs fit with the area. She told the Citizen: “I used to work in mental health for young people, and I think it’s alienating for young people of Hackney that it has become so unobtainable to live here. 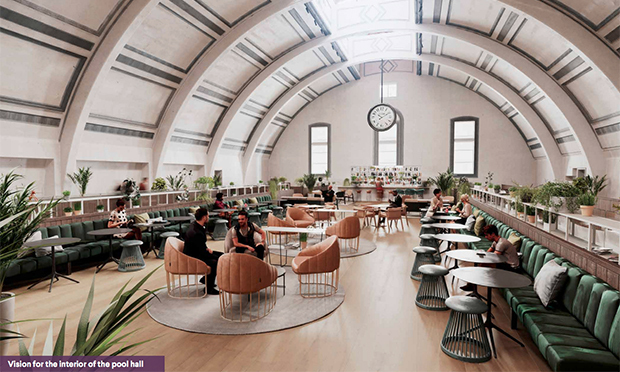 The redevelopment follows a hard-fought campaign by Save Haggerston Baths to have the building returned to its pre-2000 use as a public swimming pool. 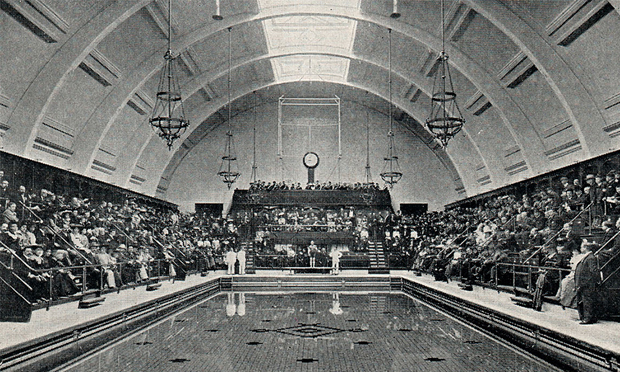 According to the Victorian Society, the Baths opened in 1904 after they were “built by Shoreditch Borough Council to serve the needs of this underprivileged area”. Brennan talked about a meeting on the future of the Baths in 2015: “I remember a local GP testifying that his parents had met at the Baths and that they took him there when he was a small child. “The room was overflowing – some had to stand outside because of how many people attended. Castleforge states in its proposals that the pool hall will have “publicly accessible” event, restaurant, café, classroom, education, and leisure space. 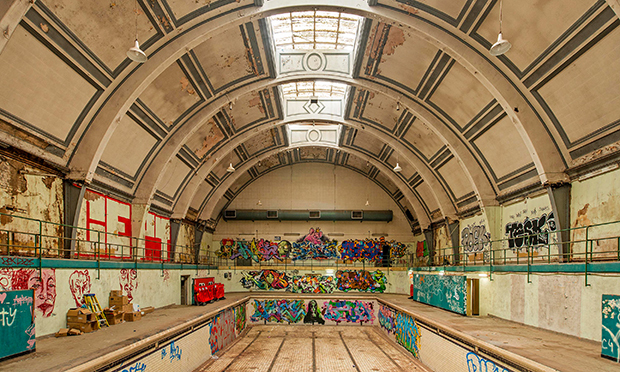 Hackney Mayor Philip Glanville said: “I am aware that local residents are keen to restore the swimming pool, and although we tried our best to make this happen, financially it was not viable. Kanda Consulting said it has collected the feedback from the first exhibition, and it will be “analysed” and made available on their website “shortly”. But residents have also raised concerns over the consultation itself, and whether or not Castleforge has left enough time to properly incorporate the public’s input. Pat Turnbull, who attended the exhibition, wrote in a letter to Kanda: “I would still suggest that a public meeting where the public has the opportunity to hear each other’s views is a more democratic method of consulting than an exhibition of boards where the public is dependent on guidance by Castleforge. “Asking the public for feedback does not mean it is going to be incorporated. I would also like to know who said what – I would like figures on what the public wants otherwise they can claim anything that suits them. “Usually these kind of developments are done in a more collaborative way than the way things have been progressing. Kanda Consulting has not responded to questions asking exactly when the public feedback will be published and how it intends to incorporate it into the proposals by June.